Russell Finex, a UK-based separation and filtration specialist, was celebrating 80 years in business at the show and presented a variety of existing and new separation solutions. 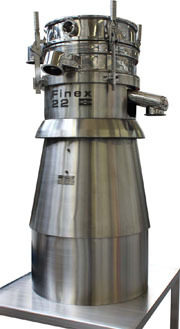 The Finex Separator, for example, is a vibratory separator for accurate grading, scalping or sizing of wet and dry materials. The company said it provides perfect movement of material on mesh, separating product using the ideal suspension and weight system to achieve the intended product flow. This vibrating screen separator system comes with an integrated control system which provides improved control and efficiency by allowing operators to control different aspects of the machine from one location. On the stand, the integrated control system included the Vibrasonic Deblinding System, which is used for removing the blinding and blocking of sieve mesh. Unlike mechanical deblinding systems this uses ultrasonic frequencies that do not cause damage to the sieve mesh, the company said. The Russell Vibrastop is an enhancement for vibratory sieves that eliminates excessive movement and sound during start up and shutdown. It bypasses the resonant frequency of the sieves, resulting in shutdown of the sieve within half a second. 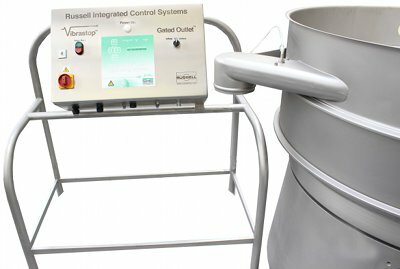 The Russell Gated Outlet is a pneumatically controlled gate inserted just inside the outlet of the sieve deck which can be inflated or deflated, allowing complete control of product discharge. This is suitable for applications where there is very little oversize or when product is discharged too soon which results in loss of good product. The Self-Cleaning Russell Eco Filter improves the quality of liquid products by eliminating oversized contamination. The machine, which was presented as a working demonstration, is available in a variety of sizes and can be fitted into existing pipework. The new Filter Management System was also shown in operation, along with the Russell Liquid Solid Separator, an advanced version of traditional liquid solid separators. This multi-purpose centrifugal separator removes soft and fibrous oversized solids from liquids and can adapt to any process. 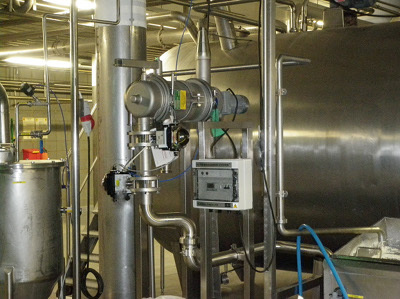 Other products included the Russell Hygiene Filter, a liquid filter for sanitary applications which incorporates a re-usable filter element and a self-cleaning wiper system; and the Russell Blow Thru Sieve, which is used in pneumatic conveying lines and allows processors to screen and transport powder materials at the same time. The Russell Compact Airlock Sieve fits into any part of a production process and achieves maximum screening capacity. 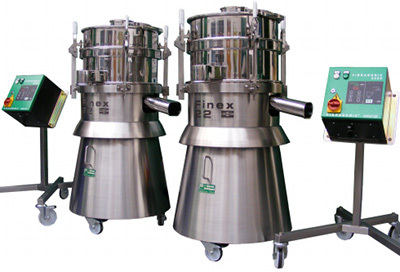 It is less than half the height of a traditional sieving machine and is suitable for screening incoming ingredients or finished powders. 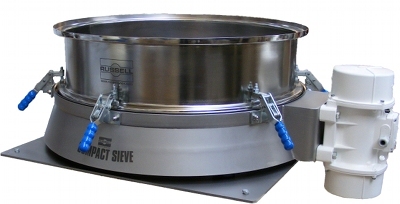 This sieve offers a high product containment of less than 1μg/m3. It comes with a patented TLI (Twist, Lock and Inflate) pneumatic clamping system. The component parts are placed into the base and located by twisting and locking the lid. An inflatable seal then locks the components in place. This reduces the dust and improves operators’ health and safety. A new 900mm model was showcased on the stand. 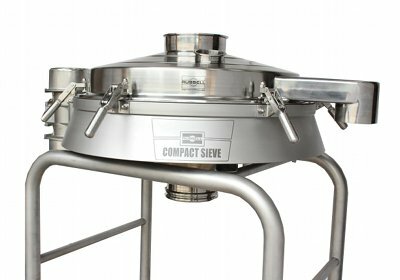 The Russell Compact Sieve is the most popular and versatile check screening machine on offer. This vibratory screener ensures accurate screening of powders and liquids and can easily be fitted into existing production lines. At the show a variety of different finishes for the machine were shown. The Russell Screen Changer was shown as a working demonstration. This unit prevents the risk of injury to operators as well as damage to mesh when changing screens on vibratory sieves or separators.